You ever happen upon that family who is amazing? Last year, at the science center, the award winners from local science fairs were on display. We spent some time wandering through the tri-fold boards and models. We ooh-ed and ahh-ed quite a bit. There were two boards that were spectacular. They happened to be homeschoolers and siblings. My jaw dropped as I read their reports. We are not that sort of family. In our spare time, we catch toads in the backyard and play grappling games on the monkey bars. Neither activities are condoned, but allowed until someone gets salmonella or breaks a bone. No one around here is researching solar panels or writing novels. Everett does do a lot of reading, but I tease him that he "reads a little too much Cheetos and not enough broccoli". Eli wants to be an inventor. He has many fabulous ideas (like a super hero converting machine that turns you into your favorite super hero), but so far they are all cardboard prototypes. We aren't one of those Time magazine cover families. I was thinking about those families and wondering what their lives were like, behind the scenes. Do parents push their children to do all of the extras or do the kids just take off on their own? Is this 'enjoyment' of academics genetic? If so, I will shrug since I don't see Einstein emerging in our five. They are fantastic, and brilliant in their own ways, but...they want to check the education box for the day and spend the rest of their afternoon playing. I was thinking about children creating solar powered toys as I showered, wondering how its done--this art of raising up brilliant children. When I emerged from showering bliss, my children had raided the linen closet. Much to my delight, they were parading around in togas discussing who they were from the Roman Empire. I call that 'enjoying academics'. I am a night owl when Seth is out of town. This week, in my solitude, I've pored over stories of waiting children. I've been reading amazing stories of families who are adopting these children. These late nights have been emotional roller coasters. Right now, I should be watching a NINE hour seminar teaching me to teach children to be excellent writers. It seems too early to be preparing for school next year when we haven't even finished this year. I have the best intentions. I find myself reading Daneille's post for today, instead of watching Andrew Pudewa. I've been visiting her blog almost daily. It's heart breaking to see so many sweet faces that are waiting. My eyes blur after seeing so many faces. I find myself thinking about them during the day. Will someone come for them? It's too overwhelming to let my thoughts linger for long. It is easy to forget the waiting children. It's easy to say that their numbers are too many. The price is too high. Caring for a child with special needs is beyond what I am able to do. My Mom once said to me, "If it's easy then it probably isn't the right thing to do." Easy is disregarding the plight of so many. Easy is feigning ignorance. Easy is thinking that YOU can't make a difference in the life of one of these children. You can make a difference! The faces I've seen are little children, slowly losing hope of finding a family. Your donation may make the difference in one family choosing to adopt that child. Sharing their stories may change the heart of the family who looks again through the photo listing and sees the face of their child staring back at them. I have to ask myself what do we do? Once I step down from my soapbox, then I must get busy doing something. I share the crushing thought of so many children and how can my family possibly make a difference? I'm still praying about that, but for now I know: there are many opportunities, beyond adoption, to help waiting children. Share their stories--join a website like Rainbowkids or Reece's Rainbow. Donate! 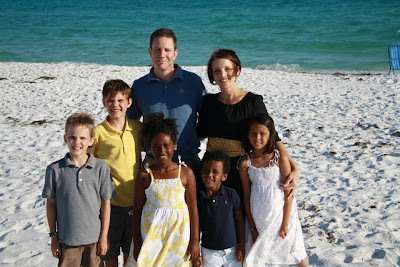 Sometimes the financial aspect of international adoption is what keeps many families from considering it. You can donate directly to a specific waiting child. Daneille is hosting a June for Jack fundraiser, raising funds towards Jack's adoption as he waits for his family to come. Visit her blog to find out the details and donate. Both waiting child sites have opportunities to donate. Short term missions...sponsoring an older child for the summer...sponsoring orphans who are not adoptable through organizations like Hopechest...and, of course, adopting! I fear that my recent posts have seemed dreary. Blog world is a funny place where even the sad posts aren't snot-and-tears-all-over-your-face sad, rather Hollywood-heroine-lip-quivering-eyes-filling-with-tears sad. I can't tell what I portray here, since I know my life is the snotty, drippy sort, not the lip quivering heroine sort. I always write knowing the reality of the situation. When I read my post about attachment, I feel discouraged. I feel discouraged for any new adoptive parents who might read it and sigh and wonder for the 108th time if they really know what they are getting into. I feel discouraged for the post-adoptive crowd who is struggling to figure out what normal means and reads that after four years we are still baffled by adoptive life. If you read that post and wonder what our lives look like, then I started this post for you. I want to be encouraging, but in a real way. I don't want you to get this image of a sullen, angry child who hates her family. That's not it at all! This morning, as I was writing it in my head (which is why my posts have become so rare...too much writing in my head and not enough making it onto the laptop). Anyway, as I was writing I was thinking of the lovely things we enjoy as a family. I had a mental list of photos from our recent trip to the beach for my sister's wedding. Definitely lovely. The garden we have been planting and watering and now, as Eli says, "We just water and watch." So lovely. The times when an academic struggle turns into success and we high five and cheer and I'm totally pumped and love homeschooling. Way lovely. Scoping out a bird's nest in my parent's yard. 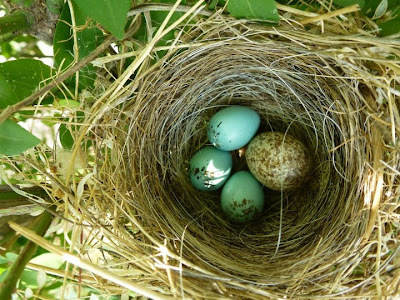 Three little blue eggs and one big brown one, delighted to see science lessons in real life, though we all pretty much agree that we really don't like 'brood parasites'. 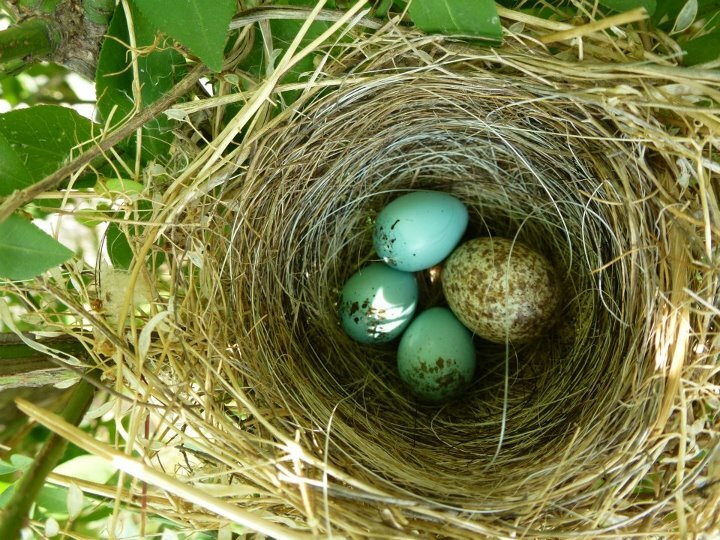 Admiring the delicate nest with the kids ranks a big lovely. But then my solace was interrupted when life happened. Probably in the middle of my mental writing of that lovely post. Someone clogged the toilet, which is basically about as un-lovely as things can be. Sally couldn't remember anything in her math book so I couldn't be interrupted to fix the toilet at that juncture. In the throes of reteaching the past 2 years of math with her, I forgot about the toilet. Then, it was lunch time. Afterwards, Josiah and I decided to water the flowerbeds. While watering, he was reminded that he needed to race to the bathroom, but hadn't heard the "don't use that toilet" message from hours ago. So he used it. And flushed. And flushed. And wouldn't you know, he flushed one more time, just because he couldn't figure out why it wasn't working. That overflowing mess greeted me when I came into the house. I only came inside because the girls were pleading with me to make them tea for a tea party. Instead, I sopped up the mess and called for the culprit to help, then carried rugs and towels to the basement to wash. I noticed along the way that the litter box hadn't been emptied since we left for the weekend. I started laundry and cleaned the box and was running up the stairs with a bag of very used litter when I heard a pleasant voice coming from the dining room, barely audible over the din made by the tea partiers who were still begging for tea to be made. I hit the top stair and saw Eli's flute teacher, smiling at me--wet with toilet water, holding a bag of cat poop, panting and sweaty and surrounded by squealing children. Our lives are not always lovely. It's a real life. Busy and lovely and sad and sometimes pretty frustrating.